NASA/TESS will identify exoplanets orbiting the brightest stars just outside our solar system. The era of big data is here—not just for life on Earth, but in our quest to find Earth-like worlds, too. Next Monday, April 16, NASA’s $200-million Transiting Exoplanet Survey Satellite, or TESS, will surge skyward on a SpaceX Falcon 9 rocket. If all goes well, over the next two years, it will search space for signs of exoplanets, or planets beyond our own solar system. So far, scientists have found around 4,000 such celestial bodies freckled across the face of the universe, including seven Earth-sized planets orbiting the dwarf star Trappist-1 about 235 trillion miles away. NASA’s Kepler spacecraft, launched in 2009, has led this revolutionary effort—but now it’s running out of fuel. TESS, its replacement, will document close-by exoplanets circling bright stars (as opposed to the more distant ones Kepler surveyed). These data points will give scientists more information about the planets ripest for scientific exploration—and which may harbor life. “TESS’s job is to find an old-fashioned address book of all the planets spread out around all the stars in the sky,” said Sara Seager, astrophysicist and planetary scientist at MIT and deputy science director for the TESS mission. 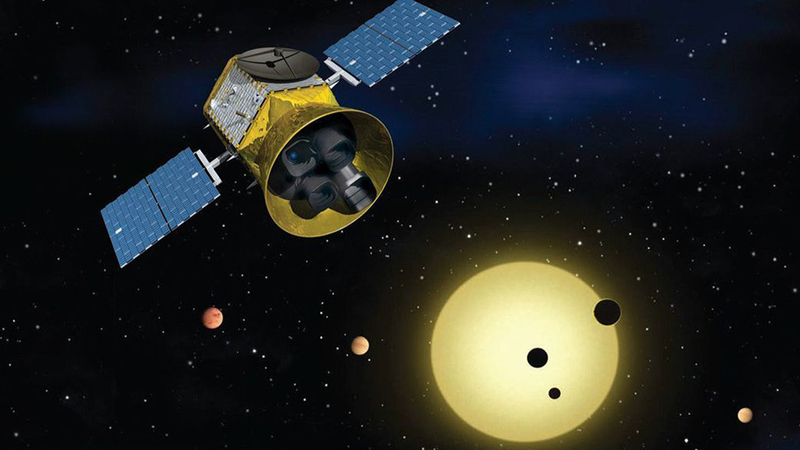 George Ricker, principal investigator for TESS, estimates that the spacecraft will be able to find some 500 super-Earths, or planets that are one-and-a-half to two times the size of Earth, and several dozen Earth-sized planets. Many of these likely orbit red dwarf stars, which are smaller and cooler than our Sun. TESS will watch for transits—the slight dimming of stars as planets pass in front of them from our vantage point on Earth. Since red dwarfs are cooler than the Sun, habitable zone planets that revolve around them will orbit closer to their host star, making transits more frequent—and thus more scientifically useful. Stephen Rinehart, project scientist for TESS, says that with Kepler, the goal was to get a narrow, deep look at one slice of the cosmos. By contrast, TESS will take an expansive look at the most promising candidates for future research—and compare and contrast them. Our history with exoplanets is surprisingly brief. While we had dreamt of them for centuries, it was only 25 years ago that we confirmed their existence. Now, we know that nearly every red dwarf in the Milky Way has a family of planets, and that maybe 20% of those planets lie with the habitable zone. With so much variety and many to choose from, scientists hope that by studying their atmospheres, they’ll be able to detect signs of life. Paul Hertz, director of astrophysics for NASA, echoes Rinehart’s optimism.